Updates to Kayode's profile since your last visit are highlighted in yellow. I did my postgraduate medical training in Paediatric Surgery from OAUTHC, Ile - Ife. I later moved to the College of Medicine, University of Ibadan and University College Hospital, Ibadan where I have been practising and teaching Paediatric Surgery to undergraduate and postgraduate medical students. Kayode Ogundoyin has a birthday today. 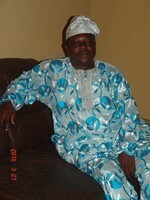 Kayode Ogundoyin added a comment on Profile.